Marie-Laure LeBlanc and Werner Pfennig come from very different backgrounds and circumstances, she is a blind Parisian daughter of a locksmith and he is an orphan from a small German mining town. While Marie-Laure is learning about marine life and reading Jules Verne in braille books, memorizing the models of surrounding streets that her father builds for her, and helping the French resistance during World War II, Werner is studying engineering and math, fixing radios, trying to escape a fate of working in the mines of his hometown, and being educated to become one of Germany's finest Hitler Youth. 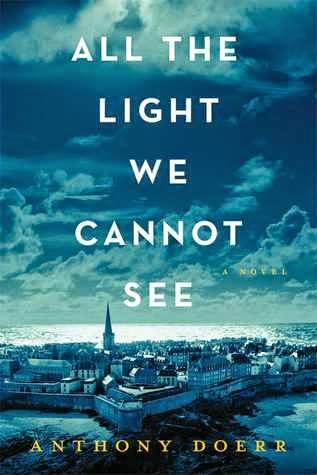 In All the Light We Cannot See Anthony Doerr takes his readers on a journey that depicts how seemingly insignificant choices and events can lead to two people coming together when they need each other most. Doerr shows how Marie-Laure and Werner grow individually, shifting between the character's perspectives each chapter, and how they come of age by making crucial, or insubstantial, decisions in their lives. He then shows how these decisions lead to their stories colliding in Saint-Malo on the Brittany coast in the wake of the devastation caused by World War II. Marie-Laure and Werner may have many differences, but they add up to an incredible ability, the ability to support each other in a paramount struggle for survival. All the Light We Cannot See is the best novel I have read, or expect to read, this year. Anthony Doerr creates a masterful puzzle with the way he interweaves Marie-Laure and Werner's lives. He builds suspense with every chapter, while also carefully illuminating the path which somehow, against all odds, lead these two characters together. The beauty in this work truly shows when these contrasting characters try to trust and accept each other despite the chasm life has built between them. This is not to be mistaken as a sentimental tale, but tears of relief and sadness are shed, I think Doerr explains it best in these lines, "Open your eyes and see what you can with them before they close forever. ", "What do we call invisible light? We call it color. But... mathematically, all of light is invisible. ", and "After awhile... even total darkness is not darkness." These lines, and many more, talk about the importance of seeing, finding light even when it doesn't seem to be there, it is not sentiment but bitter darkness that can give way to the light one may find in life. There are times when I didn't understand how Marie-Laure could tell what color something was, basically see despite her blindness, but Doerr enlightens his readers with subtle hints and clues as to how such a thing could be possible. Perhaps she makes up the colors and details, maybe people have the capacity to find a light to see by that does not depend on eyes or lights surrounding them. The magic of radio being a source of light to these characters, a source of information and life, is also delivered very deliberately by Doerr, who creates fictitious radio broadcasts and also uses lines from historical broadcasts in order to motivate and inspire his characters, as well as his readers. At times it is simple and sharp, at others it is more open for interpretation and poetic, but it all makes sense in the context of the story Doerr is telling and how he fits it all together in the end. There is also the hauntingly true and seriousness of war intertwined with the tantalizing myth of the Sea of Flames, a blue diamond that is believed to endow its owner with eternal life, while cursing everyone else around them. I love it when fiction intermingles reality as we know it with mysticism and the magical or mythological. Doerr does this too with expertise and unique ingenuity. It was difficult for me to find an adequate drink to accompany this book, but I did some research and decided that The Fog Cutter should do the trick. This drink is so-called because it is helpful for controlling high blood pressure, dizziness, and nausea as it provides relaxation to mind and body. It reduces mental stress and depression. This is because of the healthy ingredients involved, it is a juice that contains apples, red cabbage, lemon juice, carrots, ginger root, and spinach. I think drinking something healthy, promoting one's sight and fitness, is fitting to accompany a book filled with mortal peril and stress. The red cabbage also gives the drink a reddish purple hue that reminded me of the wine they often drink in the book, because even though the characters are young teenagers this is Germany and France we're reading about. Then, one doesn't have to get the mild head ache or drowsiness that accompanies drinking wine, which I do not recommend while reading a book that demands so much of one's attention.